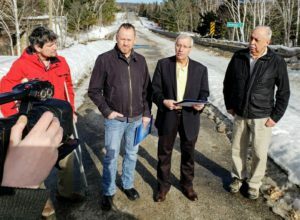 NORTH BAY – Ontario’s government is putting people first by partnering with Nipissing First Nation and investing $12 million to replace the Duchesnay Creek Bridge on Highway 17B in North Bay. The new bridge will be procured through a partnership between Nipissing First Nation and Miller Paving Limited to form a limited partnership company that is majority owned by Nipissing First Nation. Through this procurement, Ontario is working with Nipissing First Nation to create opportunities for skills development and job creation while building beneficial infrastructure. The project is located on Highway 17B near North Bay and includes one kilometre of paving, replacement of the Duchesnay Creek Bridge and removal of a bridge that crosses over an abandoned Canadian National Railway line. A portion of the project near the Duchesnay Creek Bridge goes through Nipissing First Nation reserve land. Nipissing First Nation will be providing a shuttle service during construction while the Duchesnay Creek Bridge is replaced. This will provide pedestrians with a safe crossing and maintain the connection between local transit and Nipissing First Nation during construction. Work is scheduled to begin summer 2019 and be completed fall 2020.